Trident recently released Valet, their latest Apple Watch portable charging station. With its built-in power bank and extra USB port, the dock not only charges your smartwatch and other mobile devices, but also provides them on-the-move energy. The Valet is a portable and multi functional charging station that works with all 38mm and 42mm Apple Watch models. The Apple Watch stand measures 4 x 3.14 x 4.06 inches, weights 0.38 lb, and as we can see from the images, it shows off a compact and low-profile design, meanwhile, its leather finish and plush fabric inner lining deliver us fashionable and premium feeling. 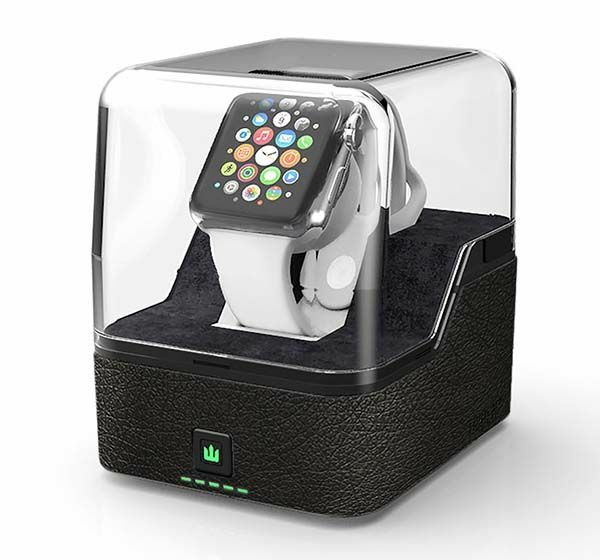 As an Watch Watch charging stand, the Valet is compatible with Apple Watch’s magnetic charger for charging the most popular smartwatch, and built-in cable organizer hides away the overlong charging cable, providing you a neat and stylish way to display your watch on your desk, meanwhile, the clear acrylic cover is detachable and used to hold your smartphone in place, and an extra USB port conveniently charges the device. Furthermore, the charging station also features a 2,600mAh backup battery, so the Valet doubles as a power bank to offer on-the-go energy for your Apple Watch and other mobile devices. And its LED lights not only indicate the charging status, but also add some modern aesthetics on the Valet. 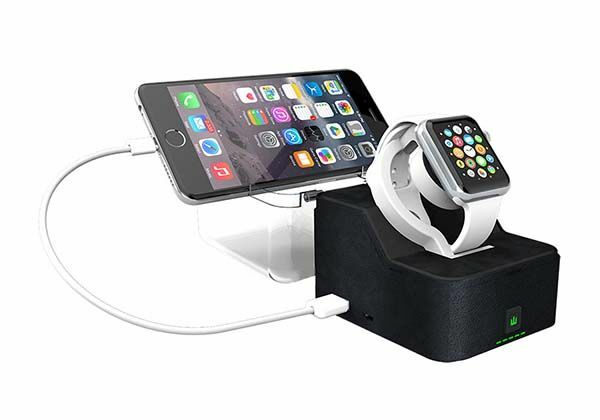 The Valet Apple Watch portable charging station is priced at $69.99 USD. If you’re interested, jump to Trident Amazon shop for its more details. Additionally, also don’t miss Pod Pro power bank and more related cool stuff by following tags.